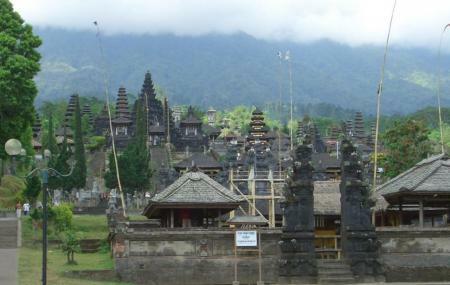 Pura Besakih is a famous Hindu temple complex in Bali. The extensive temple complex is home to 23 separate but related temples. Nominated as a World Heritage Site, Pura Besakih is built on six levels with some of the temples and the pyramids dating back to almost 2,000 years. Every year over 70 festivals get celebrated within the complex and the fantastic temple is visited by millions of visitors. While visiting the temple, both Men and Women are expected to wear Sarong to cover their legs which comes along with the ticket. It's not mandatory to get a tour guide. Stay away from the scammers. How popular is Pura Besakih? People normally club together Puri Saren Palace and Mount Agung while planning their visit to Pura Besakih. It's nice when your tour guide explains the history of each temple, religion and culture. It has many temples here including the oldest temple in Bali. We were invited in the one and only temple here that's open to all religion or none spiritual believer. You'll find their 3 Gods carved in many parts of individual temple. You'd have to pay an entrance fees which includes one tour guide, a thin raincoat and a very basic sarong. We've used our own umbrella and our own sarong we bought elsewhere. Note that your guide will ask for decent amount of tips. Which is reasonable because they guide you through the history from the bottom of the temple to top. We thought 100,000 rupiah ($7) was decent for an hour guide. Beautiful, interesting and very in-depth with the cultural history of Bali. Is a must to visit if you like to see vast green scenery as well as ancient buildings and statues. Very clean and well maintained. Many great spots for photos and with good weather, it will be an enjoyable trip. As it's call the Mother of all Temple, worth a visit. Entrance fee is charged. Tourists pay more at around IDR50-60K whilst locals pay half the price. It's quite a big temple area so take your time. Hire a guide for a fee to explain the culture & history of the temple.